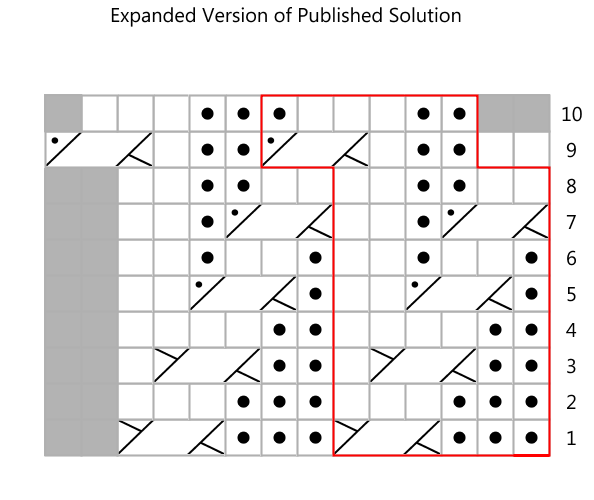 In my last column I talked about repeats with shifting borders. In this one, I want to focus on a very special case of that situation – repeats worked in the round where they cross over the start of the round. 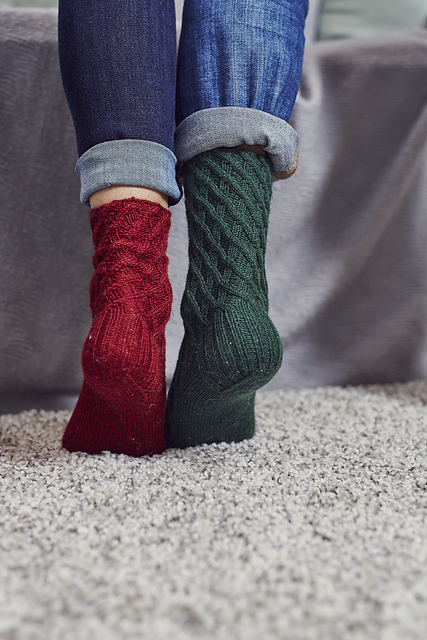 I love designing socks with all-over cables. And in particular it pleases me immensely if the cables intertwine all around the sock, making them seem… well, seamless! 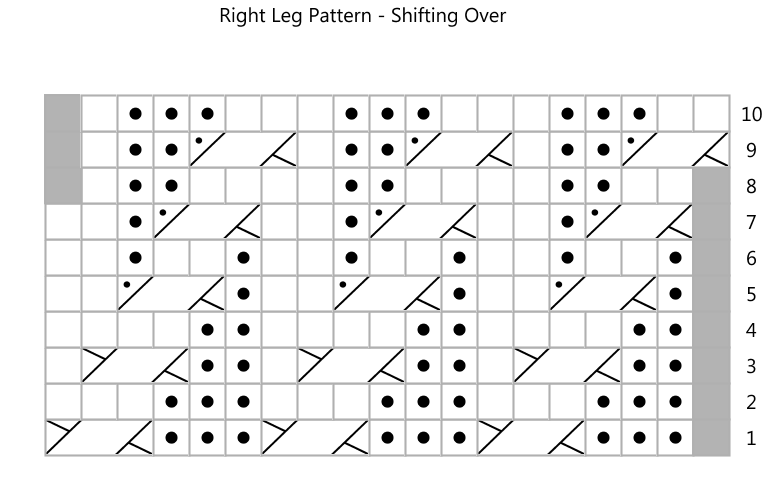 These Turn, Turn, Turn socks, are a nice example of this sort of patterning. Photo copyright Practical Publishing, used with permission from KnitNow magazine. 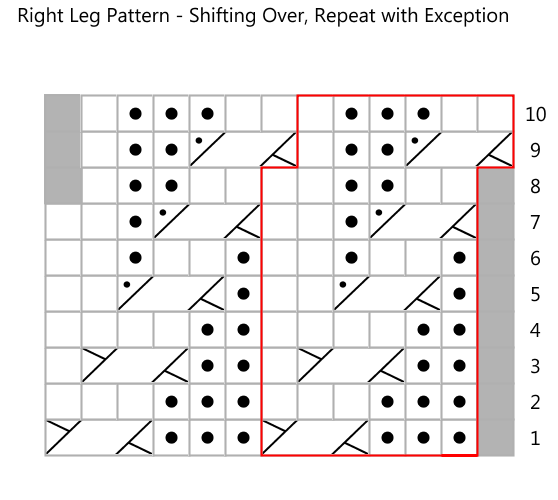 Although the pattern itself is fairly straightforward to work, the charts turn out to be pretty complicated. 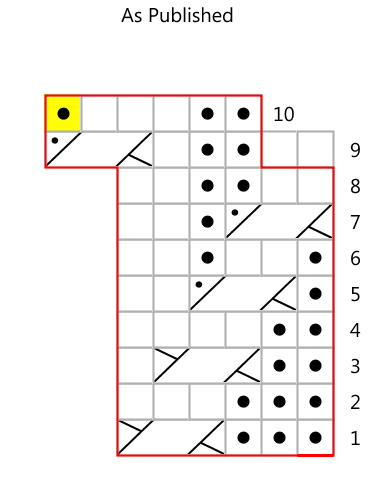 This was one of the more challenging charting problems I’ve faced. 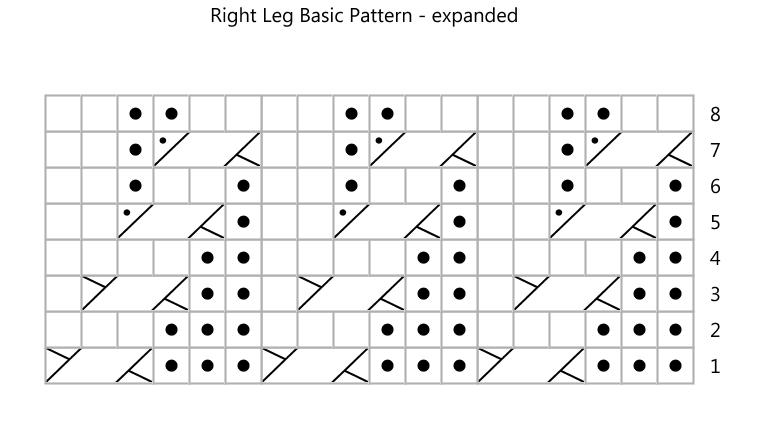 Let’s look at the Right Leg specifically, as shown in the Right Leg Basic Pattern Chart. It’s a 6-stitch repeat, and I’ve shown three repeats, and 8 rows of it. You can see how it works, it’s entirely straightforward. And it lends itself nicely to a repeat. Once you see the pattern in your fabric, it’s pretty straightforward to see what has to happen when the cable hits the start of the round, after Round 8 as shown. The cable turn that’s on the far right should travel one stitch further to the right. That cable cross takes what are currently the first two stitches of the round, and crosses them over the last stitch of the round. There are two problems: how do you actually work it, and then how do you represent that in the chart? 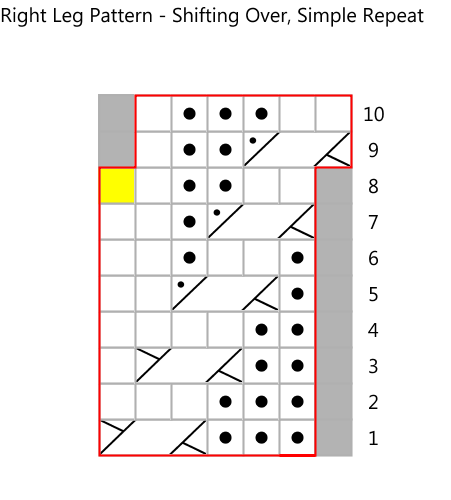 But when this happens, it means that there’s no longer tidy repeats in the chart. One solution is separate out the final repeat of the pattern, and then set the “exception” within those stitches. I’ve also seen charts that keep only the basic repeat, but use some sort of highlight to denote that stitch needs special treatment. In the example below, I’ve used a yellow stitch as a highlight. This makes the chart tidy, but then it requires some extra explanation, and it can make for a fairly unwieldly legend. There is a larger issue, however: even with this shift in the start of the round, we’re still not back at Round 1 of the pattern. 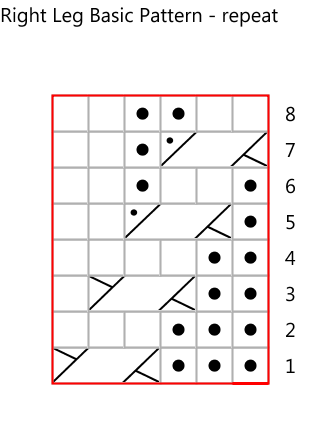 That is, after Round 10, you couldn’t just start working Round 1 of the chart again, the stitches wouldn’t line up. You could add more rows to the chart, but you don’t need to. 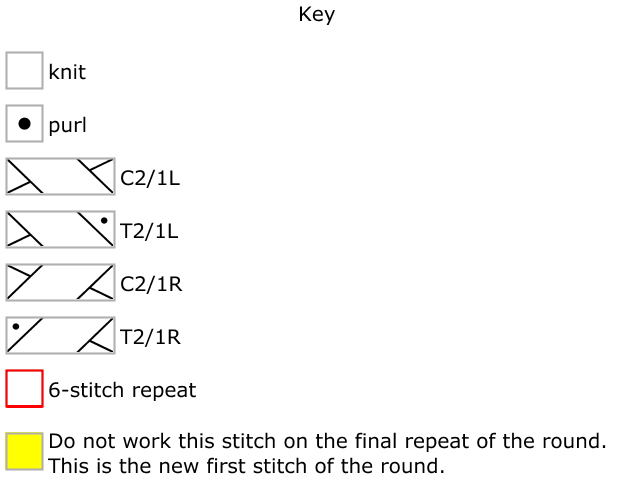 You’re effectively back at the start of the pattern motif, in that you’re back to (p3, k3 ribbing), but the start of the round doesn’t correspond to the start of a repeat. To be able to go back to the start of the pattern, you need to have a round that starts with 3 purl stitches. That is, a further shift in the start of the round is required. Stopping Round 10 four stitches early gets you what you need: you’re positioned after a knit rib. But I didn’t like that. It’s complicated to manage on the needles, and I didn’t like how big the shift was – it’s five stitches. If you worked it this way, you’re moving the start of the round a full five stitches back, every ten rounds. In the final pattern, I actually did something entirely different. It’s tidier, and turns out to be much easier to manage on the needles. In all the versions above, I’m moving the start of the round earlier… that is, stitches are effectively being skipped in a round. In the final version of the pattern, I went the other way… I worked extra stitches at the end of the round, shifting the start of the round to the left. In Round 9, I worked 2 stitches, slipped them to the end of the round, and then began the repeat. And in Round 10, I stopped the final repeat one stitch early, to make sure that I was in the right place to start the chart again. This was easier to work, only moving one or two stitches back and forth, and a little bit easier to visualize, too. This is the expanded version of this chart, with the exception repeat at the end, as in the one three above. Ultimately, both of these solutions work, and both of them are entirely correct. 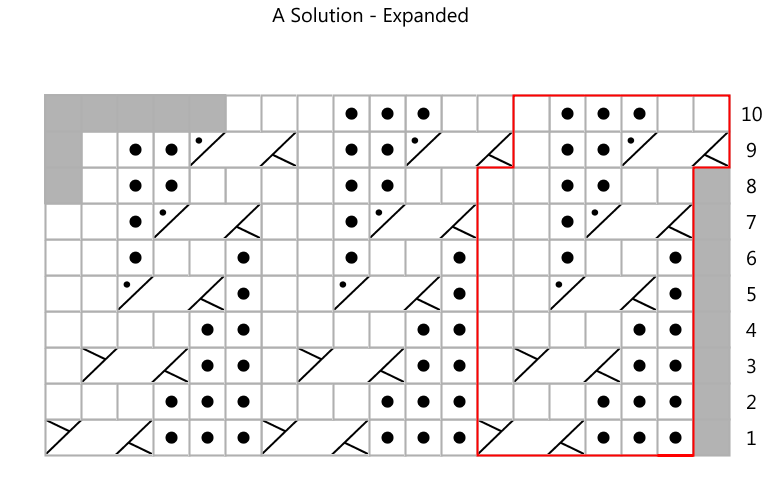 There is more than one way to solve this problem! As to which is easier or better? I don’t know that there’s a clear answer. Which do you prefer? Which do your knitters prefer? This is where test knitters are worth their weight in gold! Irregular shaped charts? No problem!